From Hawaiian shirts to playing in a jazz band, epidemiology professor David Kleinbaum is known for creativity. After almost five decades, he's still devising new ways to engage students — including this year's debut of ActivEpi Web. With a teaching resume spanning nearly five decades and retirement on the horizon, epidemiology professor David Kleinbaum could choose to rest on his laurels. But that wouldn't be his style, anymore than exchanging his trademark Hawaiian shirts for a staid suit and tie. 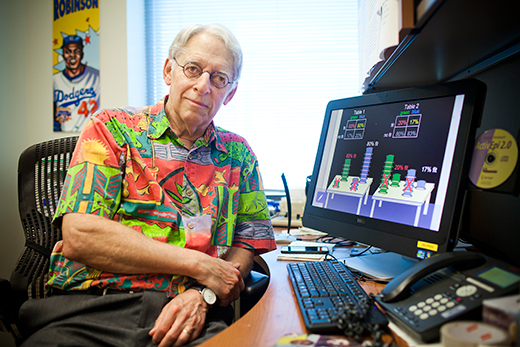 Instead, Kleinbaum — who received his PhD well before IBM and Apple marketed their first personal computers — continues to expand his educational efforts, including this year's release of ActivEpi Web, an app for teaching current concepts in epidemiology. Kleinbaum joined Emory's Rollins School of Public Health in 1993, after more than 20 years at the University of North Carolina at Chapel Hill. He won Teacher of the Year at Rollins just five years later, an Emory Williams Distinguished Teaching Award in 2000, and the first Association of Schools of Public Health/Pfizer Award for Teaching Excellence in 2006. Through the years, he has consistently sought out methods to use technology to keep his students engaged — from using overhead projectors in the days before computers were widely available in classrooms, to the 2001 debut of ActivEpi, the first CD-ROM textbook on epidemiology, which he developed from the ground up. "I have had a longtime interest and experience in creative teaching techniques, including multimedia ways to present material to a wide variety of audiences at different educational levels, usable in different teaching formats, and available to both the developed and developing world as well as the economically disadvantaged," Kleinbaum explains. ActivEpi accomplished that through 15 lessons covering topics typical to introductory- and intermediate-level epidemiology textbooks, but using a multimedia format that features animation, video, interactive exercises, quizzes, clickable asterisks with additional insights and information, and much more. "The many multimedia features make the learning of the connection between mathematics and the health sciences a lot more fun and interesting for a wide audience," Kleinbaum says. "Creating the CD ROM provided me an opportunity to do this in a unique way and for a new century." The project proved popular, with students and health professionals using ActivEpi for standard lecture courses, online courses and individualized learning. It was also translated into Spanish for the Pan American Health Organization. But the way people interface with computers has changed drastically in the 14 years since Kleinbaum introduced ActivEpi, and he realized that in order for the program to remain useful, it had to change with the times. Hence, ActivEpi Web — a web-based version of the course financed through about $65,000 of Kleinbaum's own savings. Since its debut in May, approximately 3,500 people have signed up for ActivEpi Web, including graduate students in public health, medical students, professionals in the health fields, undergraduates and high school students from all over the world. Emory Report recently caught up with Kleinbaum to learn more about ActivEpi Web, his love for teaching epidemiology, and the creative spirit that inspires all of his endeavors. You recently updated ActivEpi to be web-based. Why did you think this was necessary? To develop the original CD ROM, I obtained about $300,000 from a CDC grant. However, CD ROMS are now being phased out in most new computers and are not even built into tablet computers such as iPads. So to keep ActivEpi available, it was necessary to convert it into a web-based format. Why did you decide to make ActivEpi Web free instead of recouping some of your costs? I've had a long and distinguished career as a teacher, textbook writer and researcher. And I'm well off enough so that money wasn't the main issue. I know I have a special knack for teaching mathematical concepts and methods in the health and medical sciences, so my goal is hopefully to make a transformative impact on education in the health and mathematical sciences through use of ActivEpi Web throughout the world. Tell us more about your passion for epidemiology. You earned your PhD in mathematical statistics — what drew you to this field and has kept you so engaged and productive as a teacher? Ever since I was a child, I've always shown a special ability and interest teaching, regardless of subject. After I received my PhD in 1970, I taught beginning biostatistics and epidemiology at UNC — classes of about 150 students with weak mathematical backgrounds and no strong interest in the subject, which was a required course. I realized very soon that I had to work hard to make it fun and interesting in order for the courses to be successful. As a result, I used several creative approaches in my teaching, including using two overhead projectors (many years before PowerPoint) and slide-tape audio-visual presentations that I developed myself. These courses were very successful and reinforced my interest in continuing to create special approaches to teaching. What is next on the agenda for you, with ActivEpi or more generally? I'm in the twilight of a long career (over 45 years as a teacher, writer, researcher and faculty member), so I don't have a very clear-cut long-term goal at the moment, especially since I expect to retire within the next five years — when I will turn 80. My immediate short-term goal is to do whatever I can to promote the use of ActivEpi Web throughout the world, which includes contacting students, faculty, professionals and organizations that can provide users for the website. Over the next three or five years, I intend to continue to teach the same three courses I've been teaching at Rollins for the past 23 years, continue the longtime relationship I've had with the Centers for Disease Control and Prevention (one-day a week there under an IPA contract), and continue to write new additions to the several texts I've already published. In addition to all of your work as a professor, you play flute and serve as band leader for the Moonlighters Jazz Band. How does this creativity inform your teaching or research? Mathematics and music are very closely connected in that music, particularly jazz music, has a certain structure which requires both discipline and creativity to be able to learn and to play well. As a longtime teacher, one of my strengths has been to learn to be very intuitive and improvisational in how I teach in a given classroom setting. I need to determine and adjust to what I think the class is hearing from me, including slowing down or speeding up in my discussion, or using creative examples and/or language to explain difficult concepts. This is very similar to what a jazz musician needs to do when improvising on a particular jazz tune he/she is playing. I believe that learning to improvise in music has helped me to improvise better in my teaching and writing and visa versa.